Undergoing medical treatment can be an emotional time. The specialists we’ve assembled are skilled, compassionate and results-focused. 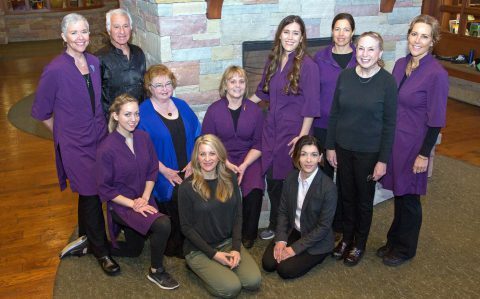 As a team, we offer a unique array of services to assist patients of Valley View in managing the physical, mental and emotional challenges often associated with a health ailment. Integrated Therapies offer a variety of complementary, individualized treatments, and are provided at no cost to patients of Valley View. Acupuncture involves the use of fine needles to stimulate the body’s natrual healing response. Research shows that acupuncture works via mechanical stimulation of muscle and collagen fibers, as well as signaling to the brain. In the hands of well-trained practitioners, it is a very safe and relaxing procedure. Aromatherapy employs natural oils, obtained from aromatic plant material to help provide a healing environment. Oils can be diffused into the air, sprinkled on linens or sometimes rubbed into the skin to help support relaxation and sleep, improve feelings of wellbeing, and even reduce nausea in some patients. Art Therapy has become an integral component of holistic care for patients and families. The process of art is not only a creative activity, but also a safe, therapeutic process that is both healing and life-enhancing. Patients and guests gain coping skills, can be distracted from pain and the stages of their illness, engage more socially and experience reduction in stress. Craniosacral Therapy involves gentle, hands-on care that encourages the emergence of new levels of order in mind and body, allowing for reduced stress, anxiety, pain, and symptoms related to treatment. Guided Imagery, Meditation & Relaxation techniques can be used for pain relief, helping patients to tolerate medical procedures, modulating the effects of medication and stimulating the healing response. The use of these practices assists patients in taking a more active role in their healing process, offering ways to cope, accelerate recovery, and calm the mind by accessing the nervous system processes. Healing Touch is a form of energy therapy that promotes a sense of well-being and relaxation, which supports the body’s natural ability to heal. HeartMath® Mentoring is a program designed to coach participants in creating heart coherence which can help reduce stress and increase energy. Labyrinth Facilitation helps a person to experience present moment awareness by virtue of their design and singular path. Labyrinth’s help to hold as well as reveal experiences of life’s journey. As a tool for mindfulness practice, walking a labyrinth or using a handheld labyrinth board can be representative of a path of pilgrimage and discovering the sacred in everyday life. Indications: Stress, anxiety, chronic pain, surgery/procedures/treatment preparation. Manual Lymph Drainage is a hands-on, light massage technique specifically designed to manage the condition of lymphedema. Massage Therapy is the manual manipulation of soft body tissues (muscle, connective tissue, tendons, and ligaments) to enhance a person’s health and well-being. Sound Therapy employs the use of tuning forks and singing bowls on and around the body to create relaxation, grounding, calm, and balance. Indications: Stress management, neuropathy, fatigue, transition support, feelings of hopelessness, discomfort with massage therapy. Tai Chi/Qigong is exercise practiced as a sequence of graceful, flowing movements in harmony with nature that help to balance mind, body, and spirit. Yoga Therapy is a restorative practice using body postures and the breath to harmonize and unite mind, body, and spirit. * To be eligible to receive the no-cost services of Integrated Therapies, you must be an inpatient or undergoing a procedure or surgery at Valley View Hospital.